Take amazing cooking lessons all day, then go upstairs, get into bed and dream about the great food yet to come: There’s a reason why cooking schools in hotels are so appealing. Here are five terrific new ones and their tastiest dishes. This new eco-lodge brings terrific food and wine to the Golden Gate National Parks, with both a Michelin-starred restaurant, Murray Circle, and a cooking school run by F&W Best New Chef 1997 Kelsie Kerr. Kerr invites local guest chefs, food artisans and vintners to teach classes both advanced (sausage making) and fundamental (roasting meat). Sazón, the school at Casa de Sierra Nevada, is tucked in the back of the resort’s artisan tabletop shop. Every day the hotel’s chef, Gonzalo Martinez, teaches homestyle Mexican cooking. Classes highlight regional recipes (Oaxacan moles) or restaurant dishes (guacamole). This 12-room country lodge in the biodiverse eco-destination Boquete dates back to the opening of the Panama Canal in 1914. A renovation last year added a new studio-style kitchen where chef-owner Charlie Collins teaches small, hands-on classes focused on traditional dishes like empanadas and local ingredients like cassava. Chef Wade Murphy. Photo © Corin Bishop. 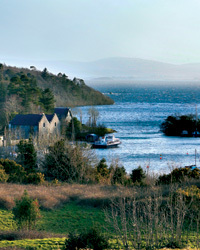 The Guinness family’s 19th-century former country estate in County Mayo recently became a hotel and restaurant. In addition to demonstrating highlights from his menu (like an insanely indulgent foie gras parfait), chef Wade Murphy gives hands-on classes on how to make simple dishes like seafood chowder. Sam Beall, owner of this glorious Smoky Mountain retreat, is a chef by training, which explains why he brought an 18th-century barn here, installed Viking stoves and launched a cooking school. Resort chefs, including Joseph Lenn and Josh Feathers, teach students to cook Southern ingredients like collards and catfish.